Yesterday I shared a card I made by simply "fussy cutting" a piece of cardstock with an interesting design, inking the edges and adding a sentiment stamp. I was thinking about the card and I realized that the designs on the pages of a cardstock stack could serve as templates or sketches for creating additional cards. I decided to make a Cricut version of yesterday's card and this is what I came up with. 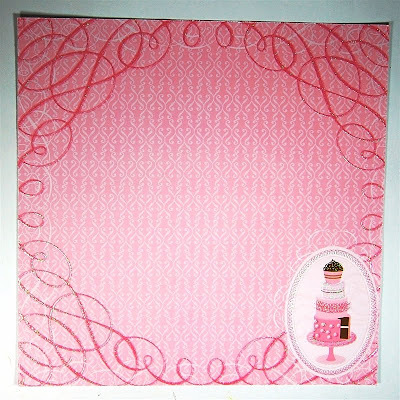 It is not a direct copy but it was certainly "inspired by..." the DCWV cardstock that I used for the first card. 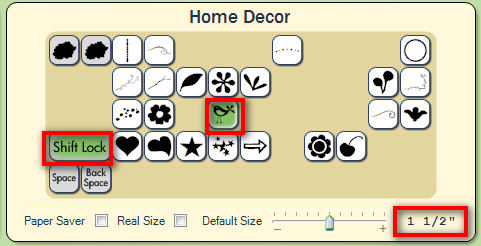 I remembered that there were a couple of birds on the Home Decor cartridge that were not exactly like the printed birds but had a similar "look." The bird with the taller tail is located at this keypad button. I sized it at 3 1/2 inches. 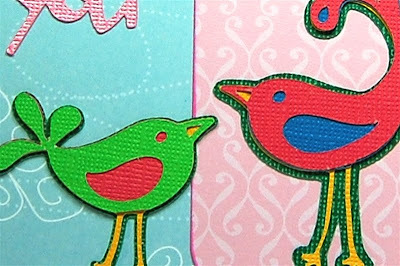 (There is a bird on the "Create a Critter" cartridge that is very similar to the bird on the cardstock but I do not have that cartridge yet). There is a second, shorter bird located on the shift of this button. I cut this at 1 1/2 inches. 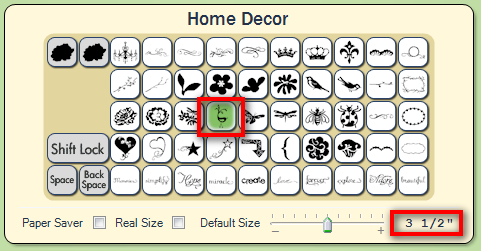 Home Decor is a Solutions cartridge with fewer creative features than a full cartridge. There is only a shadow and a shadow blackout option for each bird. In planning the layers, I realized that I would need an extra layer to get the colors to work out as I envisioned them. I needed to flip both birds to have them looking in the correct direction. 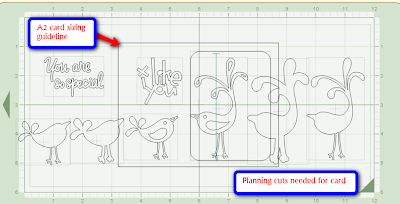 If you have the personal Cricut, there is no "flip" button but you can simply turn the paper over so the right side is facing the mat to flip your cuts. If you have Design Studio, you can flip any cut by using the software. Once again, I used Design Studio to plan out my cuts. The guideline rectangle makes it easy to determine the sizes that will work for the card front. I looked around on my cartridges for a sentiment that I liked and that would suit the space available. I chose the "i like you" on the Wild Card cartridge. 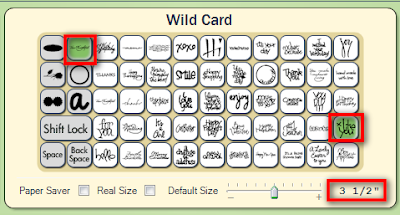 Wild Card also has a "you are so special" phrase cut which would have been closer to the stamped sentiment on yesterday's card. 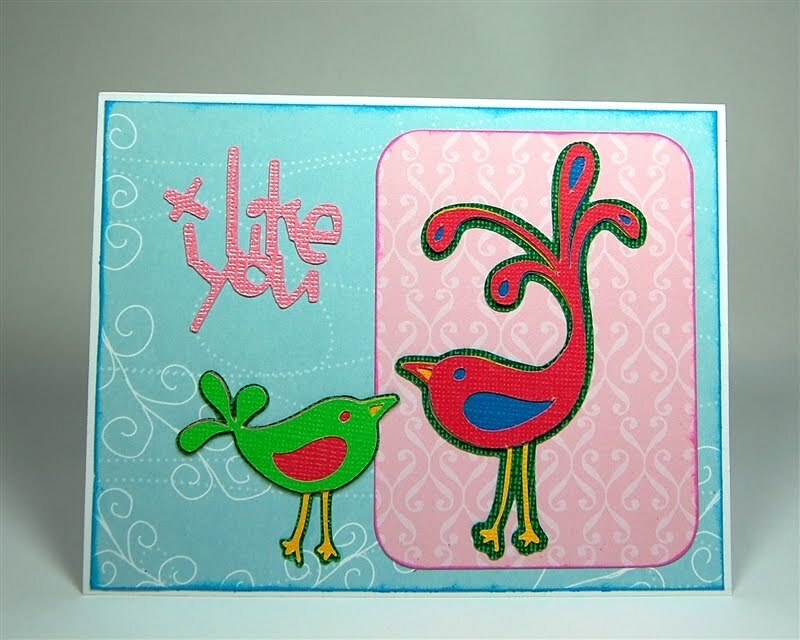 I used the Core'dinations gemstone cardstock in pink for the sentiment. I like the soft shine the gemstone cardstock has and it cuts well in the Cricut. I cut each bird four times - the shadow, two shadow blackout cuts and the top image. This photos show you all of my cuts. I used Core'dinations cardstock and the details cut neatly. The thin legs are challenging but there were no cutting issues. I used some small and very sharp scissors to snip off the legs on the two top layers and the beak on the center layer so the birds would have yellow legs and beaks. The photo above show the pieces after the "amputation" was performed. 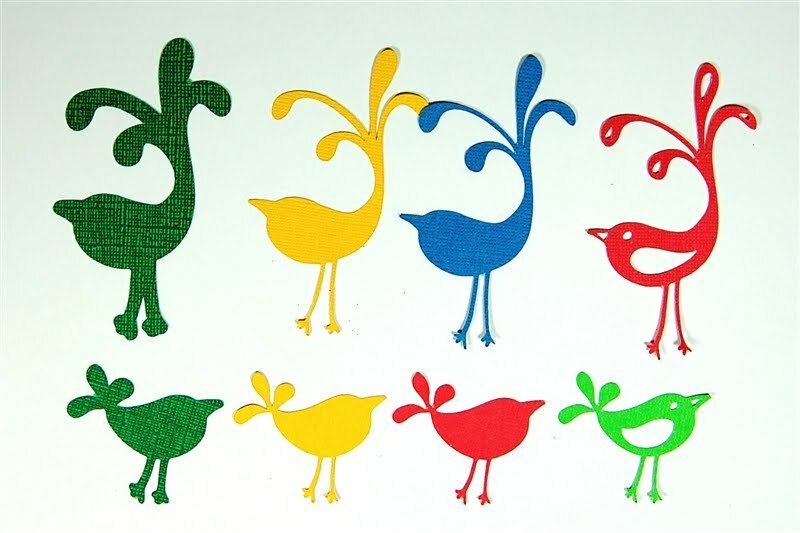 When the four layers are glued together, they produce a bird that feels like a thin chipboard embellishment. 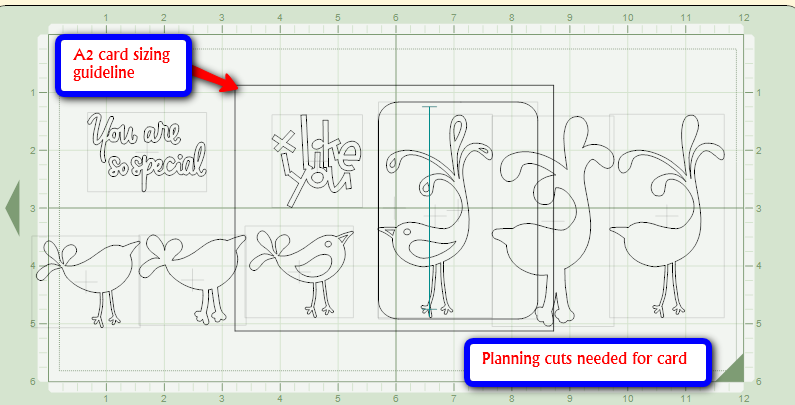 When you cut the shadows for the birds, the width of the shadow piece increase as the size of the cuts gets larger. The difference in the thickness of the shadow for a 1 1/2 inch bird and a 3 1/2 inch bird is significant. You can see this in the photo above. I hope that Design Studio may eventually be updated with an option to create a shadow in whatever width you choose. This would be a particularly great addition if you could shadow (or more accurately, outline) any item on a Cricut cartridge by clicking a command in Design Studio. The ability to create a shadow of the width you want with one click would be a very exciting option to have. I used some of the cardstock left from my original 12 x 12 sheet as the background. 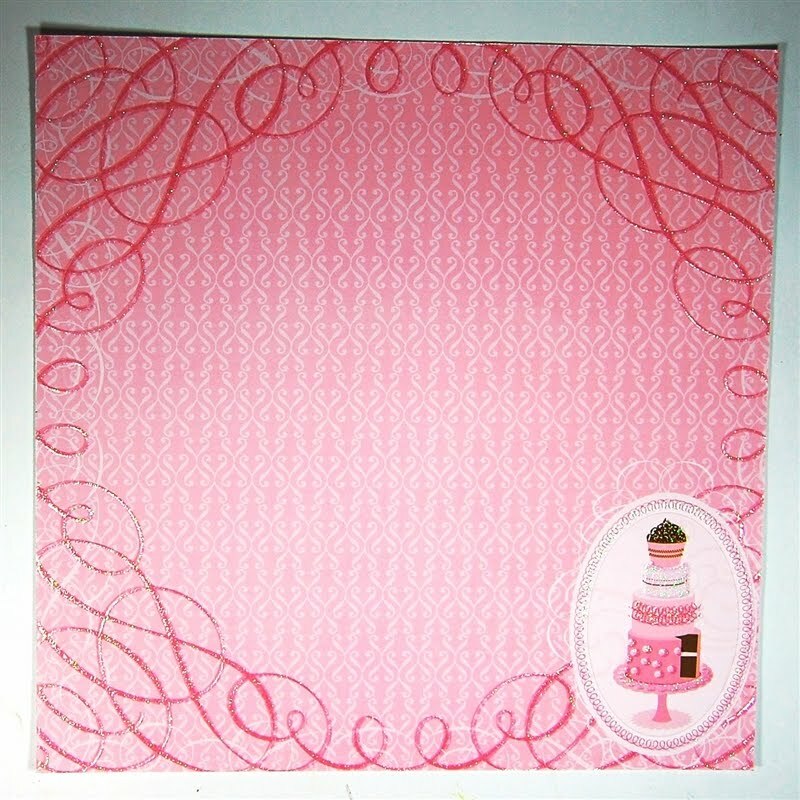 I wanted a patterned pink paper (say that three times fast!) for the rectangle on the right side of the card. I found this sheet of cardstock in the DCWV "Sweet" stack. I trimmed a four inch strip on the side with the cake (another good potential card topper) and cut a piece at 2 3/4 x 3 3/4 inches. Then I rounded the corners and inked the edges. This photo shows my inspiration card and the Cricut version side by side. I had fun trying this experiment and I will probably do another simple card and Cricut card combination soon. I have lots of stacks to look through! I like both Sat & Sundays cards. especially the colors on Sat. cards. 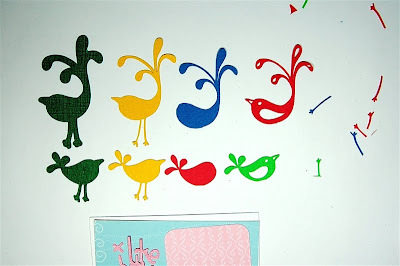 i am using those birds for a friend for game pieces. Great idea to "tweak" a great idea! 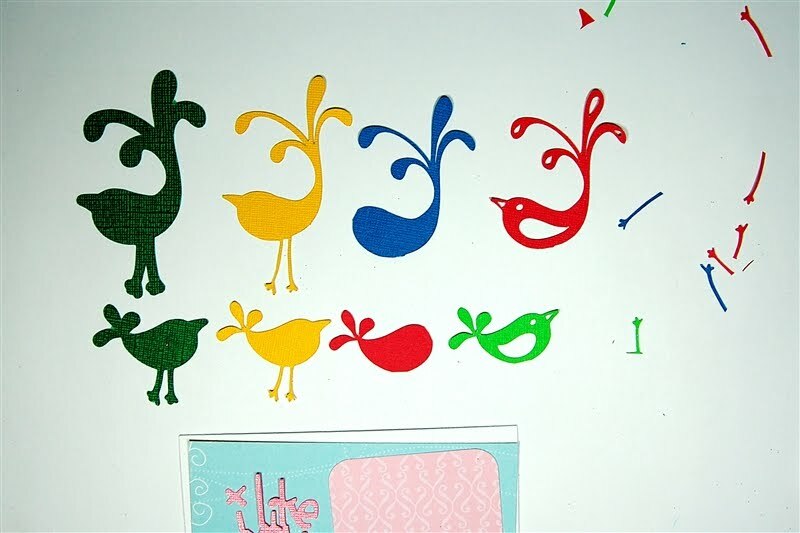 Whether the bird has long legs or long tail, I still like this design. Great card! I never thought to look at my cartridges and make something similar to paper I've seen and loved. What a great idea! 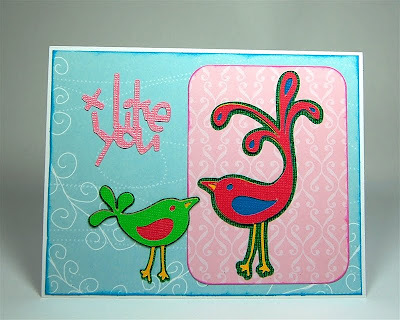 Great cards and another great idea for using the cricut to mimic something you've seen. Love the bright colours! "Fussy cutting" is a term I first heard used in quilting. Rather than just measuring the size for a piece and cutting from an edge, you carefully choose the section of the fabric (or paper) that you want to use. In this way you can center a design and choose exactly the part you want to show in the finished quilt (or paper project). So cute Diane. I like the idea of using a card for insipiration. What a fun challenge that would be--post a card image and see what a group could come up with using the Cricut. I'm sure it's been done. Great work as usual, thanks! Thanks Diane, I'll have to go look at my HD cart more carefully, you inspired me today! They are both so beautiful. The Core'dNations paper sure does make the birds pop. what are the odds of this happening? i just posted on the message board my 'hello friend' card with these two birds. check it out. Love this card and I wanted to let you know I had not used the Core'dinations gem ston paper until I saw some of your things you had made, and I had to make a purchase! Thanks for all your wonderful explanations as to how you do each of your cards. That is really funny - great minds think alike and all that! I popped over to look at your card - it is very cute! Hmmm - I wonder if we will use the same cuts again this week! Marjorie - I am glad you like the Core'dinations paper - I think it works really well and the colors are so pretty! Pam - that is a great idea for a challenge - watch this space! Thanks everyone - it makes me happy to think I inspired you!